This section of the guide will be dedicated to topics related to invaluable companion - your faithful steed. It’s an integral part of the game and plays a great role in your life as a virtual outlaw. It not only serves as your main means of transport, it’s also acts as your mobile storage of weapons, outfits, masks, supplies, etc. 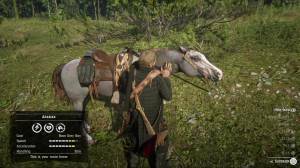 Like Arthur, horses also have Stamina and Health cores which needs to be maintained by giving it food and even fortified by using special consumables. When you rest in a camp, these cores are also restored. You can view your horse’s stats in detail by going to the Menu > Player > Horse. Your horse doesn’t require much attention to maintain but you do need to feed it using various provisions and even wild plants to restore/maintain its cores. Thankfully, there’s no “thirst” meter or some sort so there’s no need to bring your horse to a body of water to drink. However, you still need to consider feeding it regularly not only to increase your bond but to ensure that your horse doesn’t become underweight as well. Frequent interaction with your horse is necessary to increase its bond. This can be done by pressing L2 to aim for your horse and to access various options like feeding, patting, brushing, etc. You can also use the same command if you want to calm down your horse if agitated. 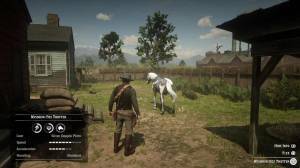 The same command can be used to interact with other horses though some options may not be available. Don’t worry as well if you accidentally aim your weapon at your horse; the game is designed for you not to accidentally shoot your trusted steed. 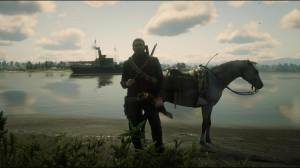 Like Arthur, your horse can also get dirty due to various activities like loading up carcasses to it, traversing in various terrains, and just as simple as riding it. If the horse remains unwashed, it will soon suffer from detrimental effects. Worry not however since getting your horse clean can be done by frequent brushing, riding your horse along streams or any body of water, or even cleaned automatically when riding through the rain. The game features a lot of types of horses, each with their own quirks, strengths, and weaknesses. They’re also part of the compendium so make sure to keep an eye out of possibly new breeds of horses so you can study them.